Thus reads the vision statement of Hindustan Unilever Limited (HUL), a leading fast-moving consumer goods company in India. But there is nothing ‘Fair and Lovely’ about HUL in Kodaikanal, often referred to as the “Princess of Hill Stations”, a much sought after tourist destination in Tamil Nadu. The HUL, which posted an annual revenue of Rs 28,019 crore in the year 2013-14, has not acquitted itself well either in terms of protecting the environment or caring for the lives of its former workers at its thermometer factory in Kodaikanal, which was established in 1983 but closed down in 2001. They battle for their lives and for remediation of the polluted soil and environment in this quiet and verdant part of Kodaikanal caused due to careless disposal of mercury used in the manufacture of the thermometers. Fourteen years after its closure, justice eludes the hundreds of former HUL workers and their families who are suffering from chronic illnesses. 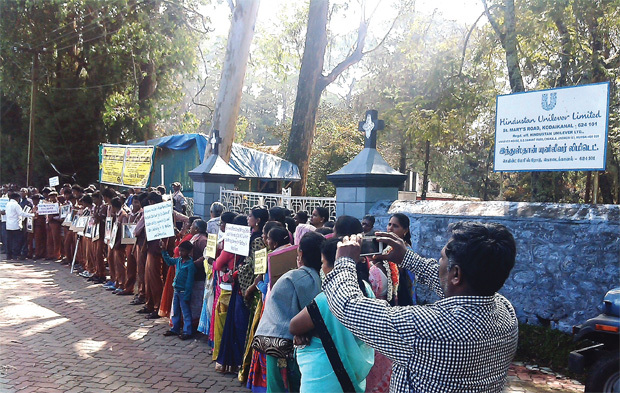 Over the years, the former employees have held many sit-ins and organised several protests, including observing a Global Day of Action on 7 March (this year it was observed on 6 March) to mark the anniversary of the closure of the Kodaikanal factory, all in an attempt to highlight the HUL’s labour, environmental and social practices in contravention of its stated commitment to sustainability and responsibility. 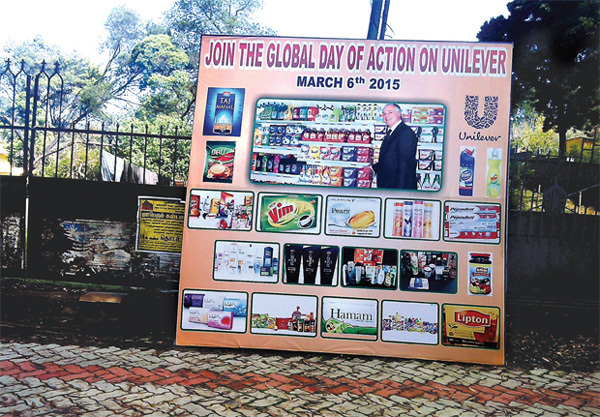 The HUL invades households in myriad forms what with its 400-odd brands and 20 consumer categories worldwide. In India, an estimated 700 million consumers use the HUL’s 45 active brands of beverages, cleaning agents, soaps, shampoos, teas, detergents, personal care products and water purifiers, among others. The company owns some of the best-known brands such as Fair and Lovely, Dove, Ponds, Surf, Lux, Vaseline, Kissan, Bru, Lipton, Magnum, Annapurna and Pureit. “We meet everyday needs for nutrition, hygiene and personal care with brands that help people feel good, look good and get more out of life,” reads the home page of the HUL website. However, its own conduct insofar as its Kodaikanal factory is concerned has been far from satisfactory. “The Global Day of Action is an act of grassroots mobilisation where communities, labour organisations and environmental groups that are aware of Unilever’s real story of labour and environmental rights violations get together to tell Unilever that we are watching and speaking out. This year, people from the UK, the US, South Africa and Minamata, Japan, have participated in the Global Day of Action,” Jayaraman adds. Kodaikanal, which in Tamil means the “Gift of the Forest”, changed forever in 1983 when Chesebrough-Pond’s Inc relocated its decades-old mercury thermometer factory from the US to India following the tightening of environmental regulations in the US due to mercury’s toxic effects. The factory was (wrongly) registered as a “glass manufacturing unit” and allowed to come up in a residential area bordered by a watershed forest. The factory produced 163 million thermometers using about 900 kg of mercury annually, which were exported to the US and Europe. In 2001, the Tamil Nadu Pollution Control Board (TNPCB) ordered the closure of the factory for violating environmental laws after it was detected that the factory had dumped 15 tonnes of broken thermometers containing mercury in a scrapyard. The company claimed that the waste deposited in the scrapyard was “tinged with mercury [that was] slightly more than 50 milligrams per kilogram (mg/kg)”. However, subsequent tests revealed that the waste contained one percent mercury or about 10,000 mg/kg (10 g per kg). This, when even one gram of mercury is sufficient to poison a 25-acre lake. The tests established beyond reasonable doubt that the company had committed an offence under the Hazardous Waste Management Act. The HUL communications manager, R Ram, acknowledges that the complaints or allegations were true. “In 2001, we became aware of an environmental breach at our erstwhile factory in Kodaikanal. Scrap glass containing mercury had been sold to a local scrap dealer in breach of our environmental operating guidelines,” Ram tells Tehelka. “We immediately closed the factory and retrieved the mercury-bearing glass and soil from the scrapyard for safe storage. In 2003, we sent all mercury-bearing material in the factory, including the recovered glass scrap, to the US for recycling,” Ram adds. On the Global Day of Action, many of the former HUL workers, environmental activists and other residents of Kodaikanal organise photo exhibitions, film screenings and undertake a mass letter-writing campaign urging Paul Polman, the chief executive officer of Unilever, to walk the talk on environmental responsibility and sustainability in Kodaikanal. On the occasion, they remind the Centre and the Tamil Nadu government to take immediate steps to clean up the mercury-contaminated factory site and its surroundings to international standards. Also on their list of demands are long-term environmental monitoring for mercury buildup in the food chain in the forests and aquatic ecosystems in and around the factory; adequate financial compensation to workers; long-term medical treatment, monitoring and rehabilitation for the workers and their families; avenues for economic rehabilitation of all the 1,200-odd former workers and their families; and prosecution of Unilever and its officials for criminal negligence. Jayaraman, though, has a different take on the events. He says that pressure from the local residents and the actions of the then TNPCB chairperson, Sheela Rani Chunkath, had forced the HUL to safely retrieve, package and ship the mercury-bearing materials to the US. Repeated attempts by Tehelka to speak to the TNPCB went in vain. Several tonnes of mercury were discharged through air and water over the factory’s lifetime. 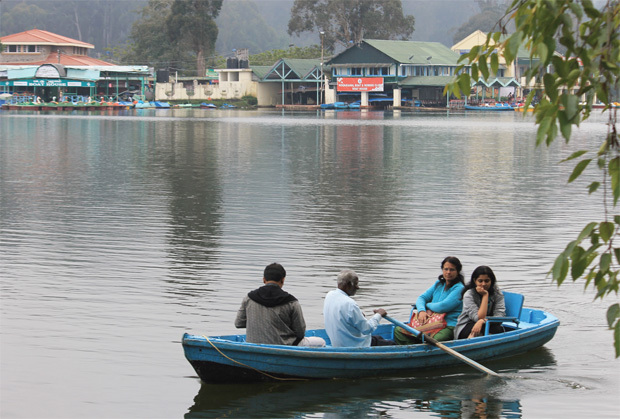 Much of it was dispersed across the ecologically sensitive Pambar Shola Reserved Forest and also made its way into the Kodaikanal lake. The rest got mixed with the soil and vegetation in and around the factory site, which subsequently was washed down into the Vaigai river and the Palar dam. • Mercury is a heavy metal that is a cumulative poison. The body cannot rid itself of the substance and poisoning can occur over long periods of time • Symptoms start with tingling or burning sensation, heavy sweating, tachycardia and hypertension • Once frequently prescribed by doctors for a number of illnesses, it is now almost non-existent • Mercury is used extensively in medical instruments and laboratory equipment • Improper handling and treatment by factories lead to contamination of air, soil and groundwater • 128 countries signed an international treaty called the Minamata Convention in October 2013. India joined a year later • The Convention is named after the city in Japan whose inhabitants were affected by methylmercury-tainted water from a factory close by. Though the incident dates back to 1956, it has affected over 2,000 people since it occurred • The signatories agreed to reduce and eventually halt all activities associated with mercury poisoning • India plans to phase out all mercury within 15 years with its production, import and export to be stopped by 2020 • In 1971 in Iraq, a mercury-treated fungicide was accidentally used to treat grains; at least 650 people died. More than 30 former workers died a premature death. Also, some infants of the former factory workers were born with birth defects such as mental retardation and debilitating physical disabilities. Many of them have since died. Gopal, 49 (who goes only by one name), a former supervisor at the HUL factory, suffers from intermittent fever and nose bleed. He regularly participates in the Global Day of Action programmes in order to “create awareness about the sufferings of the former workers, their families and other locals who have been struggling for the past 14 years”. Mahendra Babu, 53, the president of the Ponds-HUL Ex-employees Welfare Association, joined the factory in 1983 and was tasked with inserting mercury into thermometers. Babu recalls that “there was no safety gear for the workers who handled hazardous jobs and whatever was there, was inadequate”. Within a year, says Babu, “I started suffering from a continuous headache and nose bleed. Initially, I thought my illness was due to the weather conditions as I used to reach the company early in the morning.” Babu blames the exposure to the toxic mercury for his infertility. Babu has not received any compensation from the company after his medical condition forced him to resign. Only 129 employees who were working at the time of the closure of the factory were offered a Voluntary Retirement Scheme (VRS). Ramachandran, 49 (who goes only by one name), used to work in the mercury filtration department of the factory. He lost his daughter to brain tumour. “My daughter Vinodhini was 11 when she lost her battle with brain tumour. There were lots of medical complications since my wife conceived her. The root cause of all her illness was the exposure to mercury,” says Ramachandran. Some former workers and their families find it difficult to bear their medical expenses. For his part, the HUL communications manager maintains that the company was not responsible for the medical condition of some of its former workers or for any damage that might have been caused to the Kodai lake.